You've been looking for a new home for a while now, and you've finally found it. You knew from the moment you drove up to the curb that this house had potential. But now since you've toured it, you can already see your grandmother's antique buffet in the dining room, and you've practically picked out the new colors to paint the bedroom. There's so much to be excited about when it comes to purchasing a home! But there are also some basic things-you-need-to-do that are important to keep in mind as well, like a home inspection. Before we get to what you need to look for before your home inspection, let's take a look at why it's important to have one. Hopefully you're convinced by now that home inspections really are a good idea. Let's take a look at some things that you should be on the lookout for before you have your inspection. While it definitely pays to have your home checked out by a pro, it pays to keep a keen eye out for potential problems yourself, even before a contract is signed. Here are a few areas that are good to keep in mind as you're doing a walk-through of any house. Start with a side-of-the-road inspection. Look at how the house is sited. If the land slopes toward the house, is there adequate drainage? Check for straight roof lines and a roof in good shape, without odd-looking dips, bumps, or bubbles. Examine the house's exterior. If the siding and trim are painted, is there any bubbling or major peeling? Does the earth around the house come in contact with siding or trim details? Assess the condition of windows and doors. Are the storm windows intact, with all the screens and glass panels in place? Do exterior doors close flush, without difficulty? Are thresholds loose or damaged? Check the ceilings and walls for signs of water damage, such as stains or evidence of mold. Is there loose plaster or peeling paint? Do stairs feel sturdy underfoot? Are woodwork or moldings splintered or damaged? Potential problems aren't necessarily a reason not to buy the home you want, but they should certainly affect the price you'll pay. Uncovering a flaw might help you negotiate the sales price down. Even if it doesn't, if you know in advance that you have an expensive repair job coming up you're less likely to overextend yourself on the sales price. 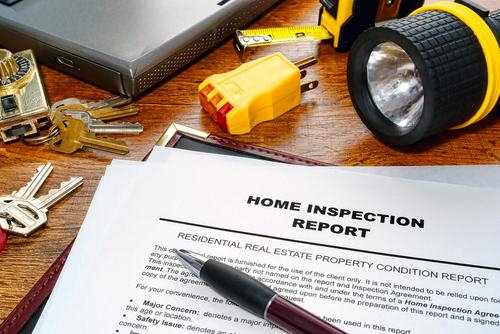 Home inspections are an important part of the home buying process. Make sure you do your homework before scheduling your inspection. Need help finding an inspector? Give us a shout... we'd love to help!